Black and white plus grey never looked this good. Designing a modern monochrome bathroom is one of our all-time favourite projects. A lot of Aussie homeowners love this style. And, this design will never look outdated… even after a decade (trust us). In this blog, we’ll show you a monochrome bathroom design with colours limited to black, grey, and white. We’ll discuss every design element thoroughly, so you know how to recreate this look on your next bathroom renovation. Black and white are two colours that always look good together, but the effect isn’t always the same. Before you design a monochrome bathroom, understand two things: black absorbs light and white reflects it. A bathroom with more dark colours looks heavy and exclusive. Meanwhile, a bathroom with more light colours seems bright, relaxing, and clean. In this bathroom, the designers went for a balanced look. They included a few shades of grey in the colour palette and kept the ratio of black & white equal. The designers used a black vanity unit to add a hint of luxury in the bathroom. They top the vanity with a black granite countertop and used matte black cabinet fronts and tap-ware. They balanced the dark elements with a grey and white splashback, plus the mirror’s reflection of the bathroom’s white walls. 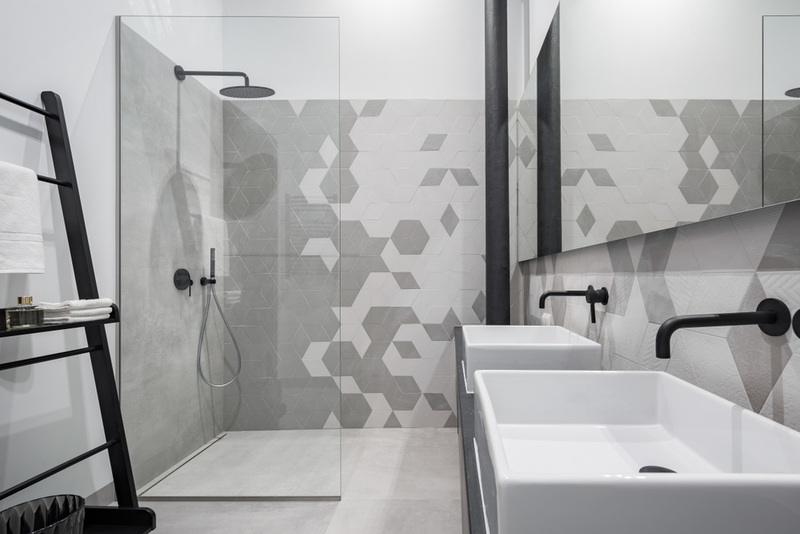 This modern monochrome bathroom proves that minimalism isn’t plain and boring. At its core, this bathroom is simple and straightforward. There are no excessive decorations that distract the user from its main purpose. The big ticket items such as the tiles, vanity, tapware, walls, and floor are already decorative… and that’s enough. There are a lot of tile shapes, sizes, colours, and finishes available in the market today. For a twist, the designers opted for something different. They used a combination of rhombus shaped tiles to create shapes like hexagons and x’s. They used tiles with different textures as well. Just look at how beautiful it is when up close! This modern monochrome bathroom is a little masculine. It’s bold, strong, and dramatic. It’s something that most gentleman will like. But, the homeowner asked the designer to create a his-and-her vanity. It’s a must have for him, since he got plans to settle down in the future. READ: Pedestal or Cabinet Sink? Which is Best for Your Bathroom? The bathroom is narrow and rectangular, and the owner wanted a separate shower. To keep the interiors light and spacious, the designers used a glass divider which enclosed the shower and separated it from the vanity. The glass divider maximises the lighting inside this windowless bathroom. The shower doesn’t feel confined as well. Work with bathroom designers from Melbourne.